If you suspect - or have been told - that your child is being bullied, it can be very upsetting and stressful for parents as well as the child involved. But there are steps you can take to help to put an end to bullying quickly, and as painlessly as possible. If bullying occurs in the school playground, classroom, on school property or travelling to or from school, parents should involve the school in putting an end to the bullying. Remember that bullying isn't just physical abuse - it can include things from being called names and teased to being left out, to being physically attacked or threatened. If you tell a teacher or head teacher that your child is bullied, you should expect a proper response from the school. Headteachers are legally required to have anti-bullying procedures in place, as well as a system in place if bullying does occur to put an end to it quickly. If you think your child is being bullied, first talk to him or her about your concerns. If your child has come to you and told you that he or she has been bullied at school, contact the school's head teacher. Write a letter clearly outlining the incident(s) that have taken place, when, where, who was involved and what the consequences were. Most head teachers will then want to interview all concerned, including you as the child's parents, and will record the incident. The head teacher should ensure that class teachers are kept aware of the situation and should keep you updated on any developments, punishments or findings about the incident of bullying. 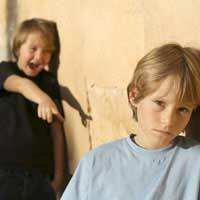 The child who was a victim of bullying should be offered support and reassurance from teachers to help to regain self confidence, while punishment of the bully might include detention, exclusion or punishment within school such as community service. The school might want to take further action within the whole school community by discussing bullying in lessons like PSHE, or during form time or assemblies. The following letter looks at the best way to approach a school if you think your child has been bullied by another school pupil. We are the parents of Roger Serton, currently in year 9 (form R), and unfortunately have to report to you that he has been experiencing bullying this year at school. Roger first came to me (Irene, his mother) three weeks ago to tell me that fellow students called Matthew and Steve, both in his form, had deliberately tripped him up in games and then took photos on their mobile phones. I thought that it might have been a one-off, but a few days after that (Wednesday 27 January), Roger told me that a larger group of boys had been teasing him during lunch break, calling him names such as 'swot'. Yesterday Roger came home with his blazer ripped after the same two boys had been pushing him around. This is obviously really upsetting Roger, who used to love school but now shows apprehension about getting up every morning. As his parents we are very worried and believe the school needs to take action. We would appreciate the opportunity to come and talk to you about this matter as soon as possible.